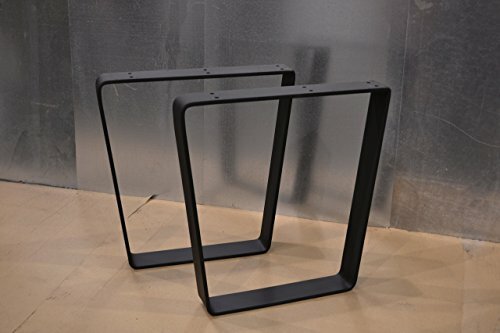 Metal Table Legs, Bent Trapezoid Style - Any Size and Color! These steel table legs add a unique blend of modern and industrial styles to any custom project or retro-fit. These legs come standard with 1/4" holes drilled across the top of the legs, and include felt pads which can be stuck to the bottom of the legs to protect the flooring. All products undergo extensive quality control checks to ensure your products are made as specified and come free of any defects or sharp edges. Please send us a message if you have any questions about the sizing, details, or applications of these legs. ***IMPORTANT*** Coffee tables, benches, and other smaller tables can use the smaller bar stock, however dining tables or larger/heavier tables should use the larger bar sizes. Tops in the 60-80 pound range should use at least 3/8" x 3" bar, and tops heavier than 80 pounds should use the 3/8" x 4" option. If the top is too heavy for the legs, the bar stock will start to slightly flex, causing the whole table to wobble. Tops heavier than 200 pounds should use a different style of legs. If you have any questions about this product by Custom Table Legs, contact us by completing and submitting the form below. If you are looking for a specif part number, please include it with your message.